Since they were now officially stuck, Suzanne suggested they take a ten-minute break, and everyone agreed. Lynn left the conference room immediately, and the others went to the back kitchen area to get coffee. That left Matt and Suzanne. Suzanne had an idea. "I'm wondering," she began, "if maybe the problem isn't someplace else." Matt, puzzled, tilted his head and said, "By that you mean…"
"I mean, maybe we disagree because we're making different assumptions about something we don't know we're making different assumptions about." Matt smiled. "I'm sorry, but tortured grammar is my specialty." They both chuckled. "But OK, tell me what you mean." Suzanne obliged. "I remember something called the Johari window." She went on to show him how they could use the Johari window to expose differing assumptions, and it went something like this. 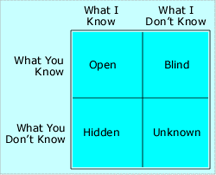 The Johari window is a four-pane window in which each pane represents a category of our joint knowledge. The panes are Open, Blind, Hidden, and Unknown. Open: I'm aware of this knowledge, and so are you. Blind: You're aware of this knowledge, but I'm not. Hidden: I'm aware of this knowledge, but you're not. And Unknown: Both of us are clueless about this. When we disagree, the sources of our disagreement can often be outside our mutual awareness. Using the Johari window to classify our assumptions, we can surface them using techniques that are best for each of the Johari window's four categories. Open assumptions are those I know I'm making, and you do too. If we agree about them, then these assumptions are unlikely to spark destructive conflict. But even if we disagree about an open assumption, it's relatively less likely to create trouble, because we can discuss it, and we might even resolve or suspend our differences. When you inventory assumptions to explore the sources of disagreements, start with open assumptions — they're relatively safe, even when there's disagreement about them. Blind assumptions are those that I make, but which I'm unaware of, while they're evident to you. Typical are the assumptions about who's responsible for what in a marital relationship, or assumptions based on professional, factional, demographic, or ethnic stereotypes. Blind assumptions are hard to find, because the assumer doesn't know they're there [Brenner 2006]. To search for them, propose candidates of your own — assumptions you think someone like you might make without being aware of them. This approach is relatively safe, because identifying the assumptions someone else might be making can seem like blaming — when we uncover a blind assumption, the assumer is more likely to have difficulty than is the assumer's partner. The Johari Window was developed by Joseph Luft and Harry Ingham (Joe and Harry) in the 1960s. There's no better work on the topic than their own: Luft, Joseph. Of Human Interaction: The Johari Model. Palo Alto, CA: Mayfield Publishing Co., 1969. It's out of print, so check the library. Would you like to see your comments posted here? rbrenWIyLEKsTHXhmvSwgner@ChacIoWWwXspAqkVxtTloCanyon.comSend me your comments by email, or by Web form. I offer email and telephone coaching at both corporate and individual rates. Contact Rick for details at rbrenfMCAMNkQMGkwetCgner@ChackAwopWbUCWcZHqdloCanyon.com or (650) 787-6475, or toll-free in the continental US at (866) 378-5470.